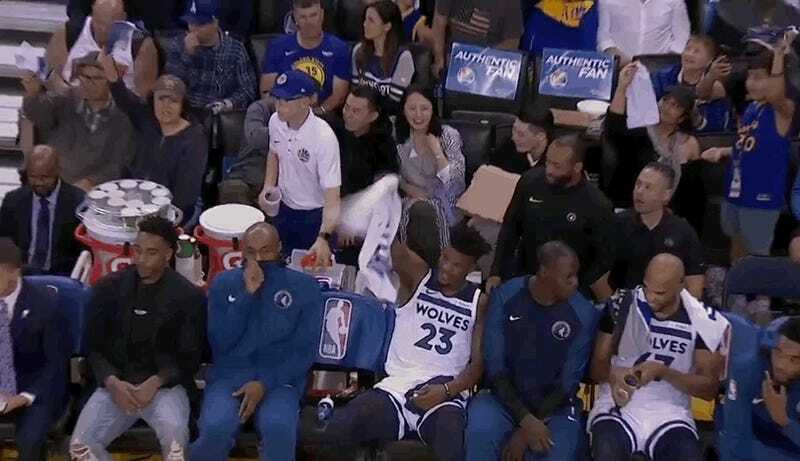 Jimmy Butler stunk last night in the Timberwolves’ 116-99 loss against the Warriors. He scored 21 points on 23 shot attempts—which included a dismal 0-for-8 from three—and was a minus-19 during his time on the floor. But thanks to the disruptive saga that he’s created for himself, that wasn’t the focus of his postgame conversations with reporters. After sitting out Wednesday’s game against the Jazz with “general soreness,” maybe, the disgruntled all-star fielded questions about whether he’d even play in Minnesota’s upcoming games on Sunday and Monday. Butler said that he was the one ultimately in charge of deciding when he plays and when he doesn’t based on how his body feels—an incredibly healthy system to say the least. When Minneapolis Star Tribune writer Chris Hines pressed him on this issue, however, Butler became a little annoyed. ﻿“Why are you so worried about my injury?” [Butler] asked, then with irritation in his voice, criticized the media’s role in the reporting of this story, which is about to enter its eighth week since Butler notified Thibodeau of his demands in a meeting in Los Angeles. You’ve got to hand it to Butler here. He’s figured out the big sports media secret that reporters are only interested in [checks notes] notable storylines. Surely this will be a huge blow to those covering future Timberwolves games, and Butler’s absences will never come up again. In all seriousness, it’s quite astounding that the brass in Minnesota have let this mess get as big as it has. Allowing a superstar to call the shots when it comes to his availability on a game-to-game basis is one thing, but it becomes entirely another when that superstar is also holding your organization hostage for the first ticket out of there. Even worse is that the longer this goes on, the closer a player like Karl-Anthony Towns gets to the point of no return when it comes to his growth being stunted. Congrats to Tom Thibodeau on staying competitive, I guess.